Try new activities in the playground or on the sports field. Be safe. 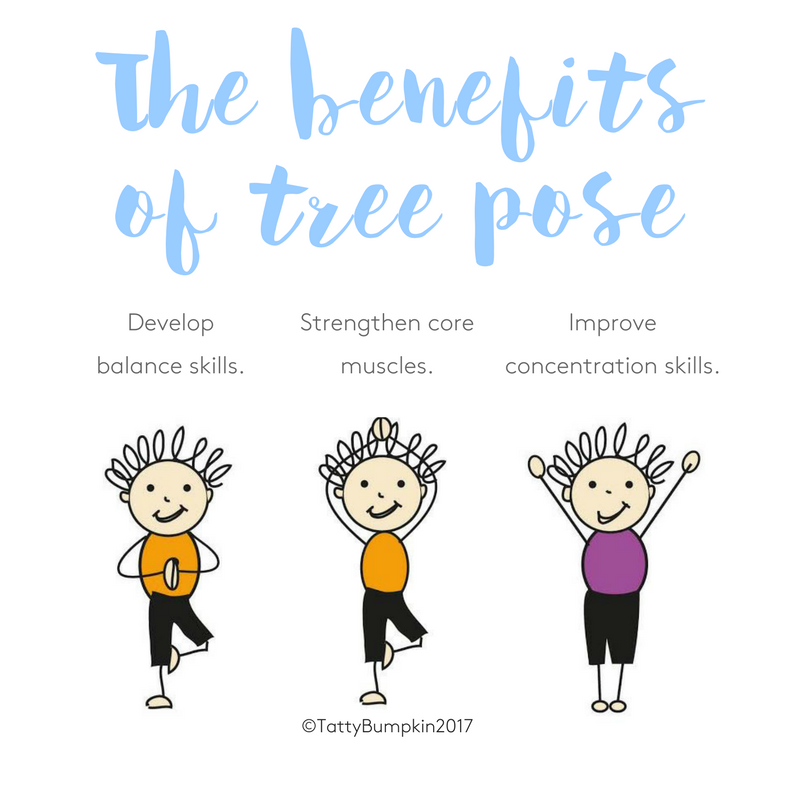 Always check with a health professional if you have concerns about whether tree pose is suitable for you or your child. Find a clear space on a non-slip surface, where you can do tree pose without bumping into anything. Take off your socks and shoes in order to receive more accurate sensory information through the feet. Try to do tree pose along with your child – slowly and carefully so that they can copy you. Your child will love to do the activity with you and moving with your child is a powerful way to strengthen the bond between you both. Begin tree pose by guiding your child to stand with their feet hip width apart, stretching their arms out to either side, like branches. Now… imagine the wind is starting to blow. Take a few deep breaths, blowing out softly, and gently rock onto one foot and then the other. As you exhale, gently twist your body round one way and then the other so that your ‘branches’ are swaying side to side in the wind. Then, take one foot a little way off the ground. See below for why this is an important step. Tree pose activates and strengthens hip, back, tummy and shoulder muscles. These large muscle groups are sometimes referred to as the ‘core muscles’. Strength in these muscles is not only important for more complex sporting skills i.e. football, dance or tennis. It is crucial for good posture, writing skills and daily living skills i.e. dressing. Balance is a complex process. As children learn to sit, stand and move around, they develop mature ‘balance reactions’. 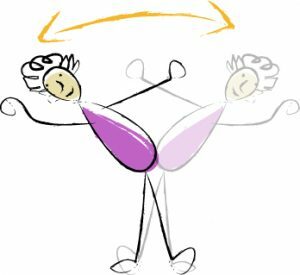 These are automatic responses which help us to remain upright and regain our balance if it is slightly disturbed. For most children these postural reactions develop as part of growing up and moving around. However, you can help your child to develop and refine these reactions by providing them with plenty of (safe) opportunities to experiment and gently challenge their sense of balance. Doing tree pose demands concentration. It may help older children to try and focus on a particular point ahead of them (drishti) whilst they stand on one leg. If this is the case, it is best to break the pose down into smaller steps. Try the activities below to help them perfect their balance skills. Start Tree pose by encouraging your young child to simply sway from side to side with their arms out wide. Like a tree in the wind. As they do this your child will automatically learn to transfer their weight from one side to the other. Start with small rocking movements, then see if your child can move further over to each side. You could blow gently on your child’s body so they can feel the ‘wind’ in their branches. 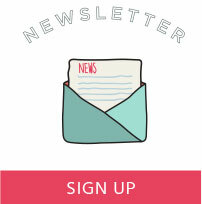 Place a low sturdy box, or a pile of 1-2 big books, in front of your child, on a non-slip surface, to make a low step. Initially, you may need to give your child some support as they step up/down. See note below on how to do this. Encourage your child to step up with one foot onto their ‘step’. See if they can hold this position for a few seconds – then guide them to bring their foot back down. This stepping activity helps your child to learn the subtle weight shifts they have to do to stand on one leg and to negotiate stairs. Start with a very low step then increase the height just a little as your child gains in confidence. Once your child has had a go at stepping up and down with one leg, see if they can do the same thing with their other leg. Your child may need some extra support as they do tree pose for the first time. If this is the case, rather than holding their hands, kneel down alongside your child and support them by holding them round their hips. If you support your child in this way they will be able to use their arms to balance – much more normal. 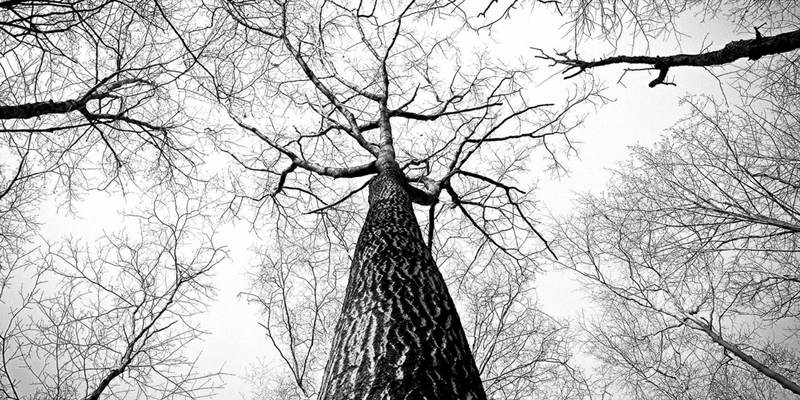 Be a tree with tiny roots! If your child is getting the idea of moving their weight onto one leg, but has not yet mastered taking one foot completely off the ground, see if they can do Tree pose with one foot flat on the ground and just the toe of their other foot on the ground. They can rest the heel of their raised foot against their main supporting foot. Try doing tree pose together whilst balancing on one leg. If your child is a bit wobbly, show them how to practice this by leaving your toe on the ground and gently resting your heel against your other foot. As your child gains confidence, they can rest the sole of their raised foot against the calf of their other leg. It is important to make sure your child does not rest their raised foot against the knee of their supporting leg as this can strain the knee joint. Note to parents: when your child moves onto one leg, guide them to try and keep their hips as level as possible and their legs slightly apart – this means they are using the correct muscles. If your child has a tendency to wrap one leg round the other in an effort to keep their balance, support them round their hips (so their hands are free to balance) and see if they can stand on one leg, keeping their legs slightly apart. Once they have the idea, you can stand back and let them do the pose by themselves. 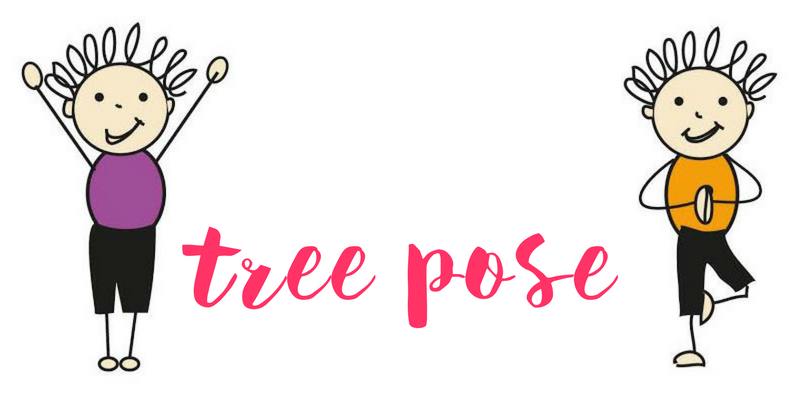 Spark imagination & make tree pose fun! Tree pose is essentially about standing on one leg. However, many children will feel far more motivated to try being a ‘big tree in the jungle’ or ‘an apple tree in an garden’ rather than to just keep trying over and over again to stand on one leg! To make tree pose more engaging for your child, give them two apples to hold in their outstretched hands – then they become an apple tree. 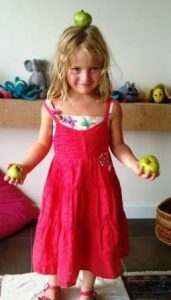 The weight of the apples will also help your child to become more aware of their arm movements, which will help them to balance. You might even try balancing a third apple on top of your head! How many apples can you have on your tree? 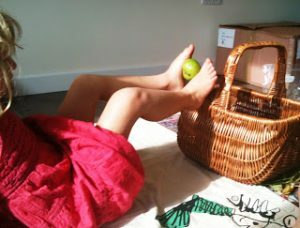 Have a go at picking the apples up with the soles of your feet to put them in the basket. This game is great for strengthening foot and tummy muscles. 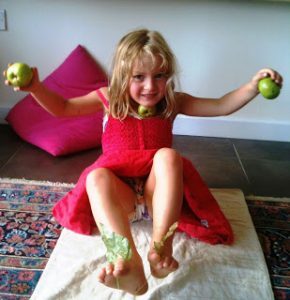 See if they can roll an apple under their bare feet – great for balance and for activating their foot muscles. Play the ‘wormy apple’ game! Carefully core one apple. Then give your child a pipe-cleaner to represent their worm. Guide your child to thread their worm through the cored apple. Younger children will need the apple held for them, and will thread the worm through one side, then pull it out the other using the same hand. Older children can be encouraged to thread their worm through the apple with one hand and pull it through with the other – this is a great activity for eye hand co-ordination and fine motor skills. Whilst standing in a supermarket queue! When you are passing a tree whilst out for a walk. Pick up two leaves, hold them out wide in each hand, then copy the tree you are next to. Practice little and often, as this is the best way to learn a new skill! To experiment with putting the leaves between their toes whilst they are sitting down and try to wave their feet in the air with their leaf! (Watch your child closely so they do not fall backwards). This is a great activity for balance, and strengthening tummy muscles. Older children can see if they can balance apples in their hands, whilst they are waving the leaves with their feet! To look at the leaves closely and see if they can make their body into a similar shape to the leaf (long & thin, spiky or round)? To play a ‘collecting leaves’ game with you. Put a basket down for the leaves and see how many you can collect and put into it. As your child plays this game they will not only be feeling the leaves but they will be encouraged to balance in squatting and practise their hand skills as they pick up the leaves. To ‘have a go’ at blowing the leaves – hold the leaf on the back of your hand and see if your child can blow it off! 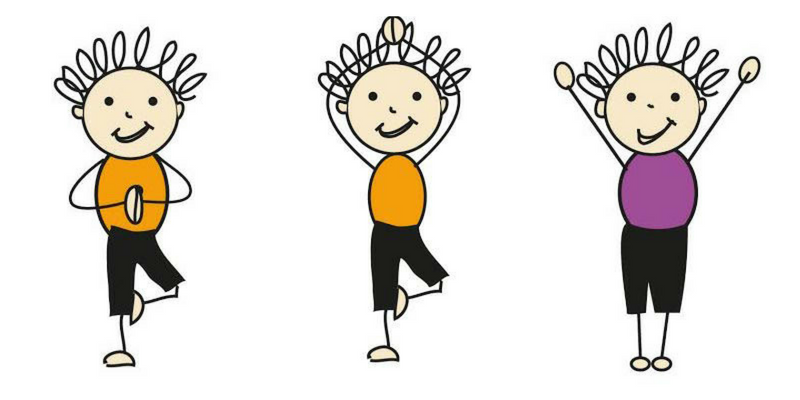 For a simple yet fun maths activity to play whilst doing tree pose visit Fantastic Fun & Learning. For more poses to help concentration, take a look at our post about using yoga to support & improve reading.